Please note that these courses are physically demanding and occur in a fresh water lake. The temperatures in June can be extremely cold. We strongly recommend that you bring a wetsuit. Lifeguard Certification is highly recommended for anyone teaching children on the water. Refer to American Camp Association Accreditation Standards for appropriate water sport training requirements. 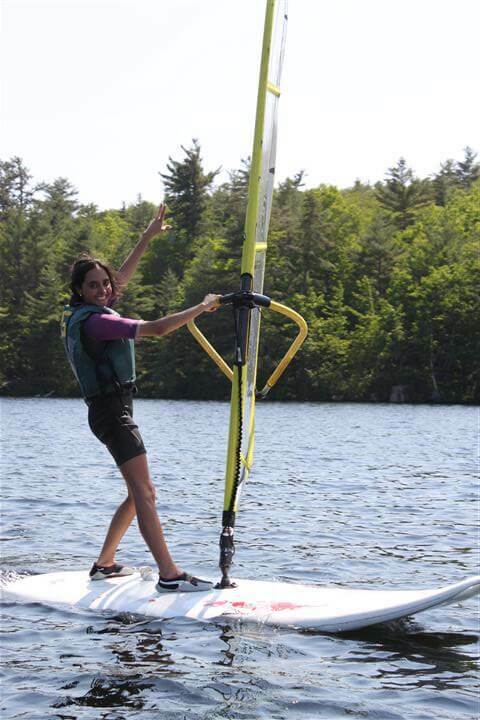 Purpose: Review and practice of windsurfing skills, and care and knowledge of equipment. To learn teaching progression and strategies. To focus on safety including a risk management plan. Offers practice teaching opportunities. Please note that Day 1 includes review and practice time for windsurfing skills and specific introductions to equipment care. Days 2 and 3 are identical in content and coincide with the Experienced Windsurf Instructor Workshop. Evaluation: Instructor will provide written confirmation of attendance and evaluation of skills and teaching ability. Participants should be accomplished windsurfers and have knowledge of equipment, rigging, and practical sailing skills. Purpose: Expand existing windsurfing knowledge to include teaching progression, strategies, safety, and risk management. Offers practice teaching opportunities.